Family meals in the Chute household are civilized affairs, but then these are hockey players we are talking about. 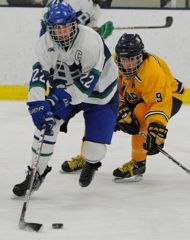 “We have to guard our food at the table,” said Blake senior forward Donald Chute, whose older sisters, Katharine and Margaret, were standouts on the school’s girls’ hockey team before heading to play for Harvard. Throw in a couple of younger brothers with healthy appetites, and Donald has a basis of comparison when it comes to explaining the tenacity around the net he shares with Christopher Chute, a sophomore. 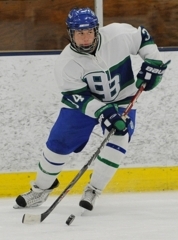 Christopher Chute also scored as Blake, ranked No. 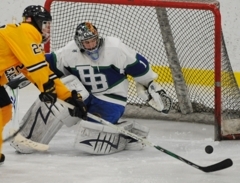 5 in Class 1A, improved to 8-1-2 despite playing a schedule that has included Class 2A teams such as Stillwater, Cretin-Derham Hall and Holy Angels. 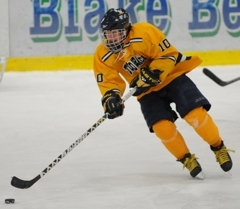 Totino-Grace was one of just two undefeated teams left in the state (Hermantown is the other) entering the game. But the Eagles hadn’t played a caliber of schedule that could match the Bears’. 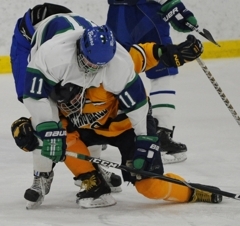 Trailing 4-0 entering the third period, Totino-Grace scored twice in the opening 4 minutes, 7 second to make things interesting. 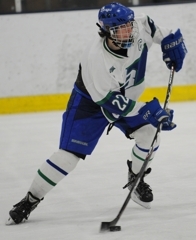 Blake, however, got a power-play goal from senior George Ordway to pull ahead 5-2 late in the period. The Chutes’ nonstop motors and constantly moving feet are trademark family attributes. 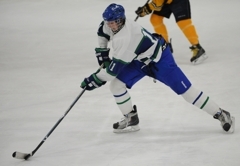 Listen to this description of Katharine Chute, who was named the state’s Ms. Hockey in 2007. The quote came from Blake girls’ hockey coach Brano Stankovsky, who might just as well have been describing Donald and Christopher. Of course, Blake is more than a two-brother team. 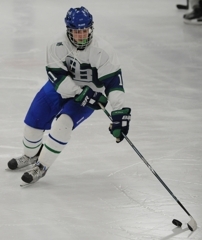 The playmaking of Ordway and booming shot of defenseman Ryan Bullock, a standout in the Upper Midwest High School Elite Hockey League last fall, help fuel a deadly Bears’ power play. 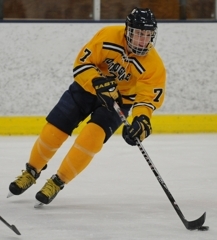 Blake scored on all three of is power-play opportunities against Totino-Grace and is converting 37.3 percent of its chances. 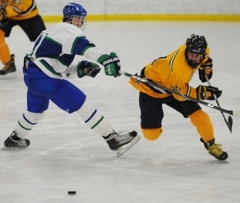 Blake senior Donald Chute scored twice and his sophomore brother, Christopher, added a goal as the Bears beat Totino-Grace 5-3 to end the Eagles’ eight-game winning streak to start the season on Friday, Jan. 7, at Blake School Ice Arena in Hopkins. 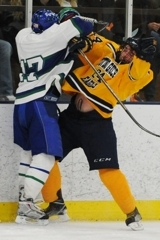 Trailing 4-0 to start the third period, Totino-Grace (8-1-0) scored twice in the opening 4 minutes, 7 seconds. Derek Lodermeier and Xavier Fust had the goals the energized the Eagles and forced Blake to take a timeout. 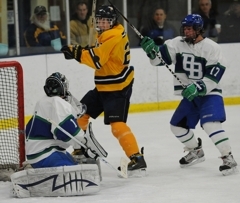 Blake’s George Ordway scored a power-play goal with 4:04 remaining to give the Bears a 5-2 lead. 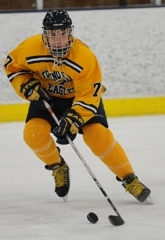 Brian Schlagel completed the scoring for Totino-Grace. 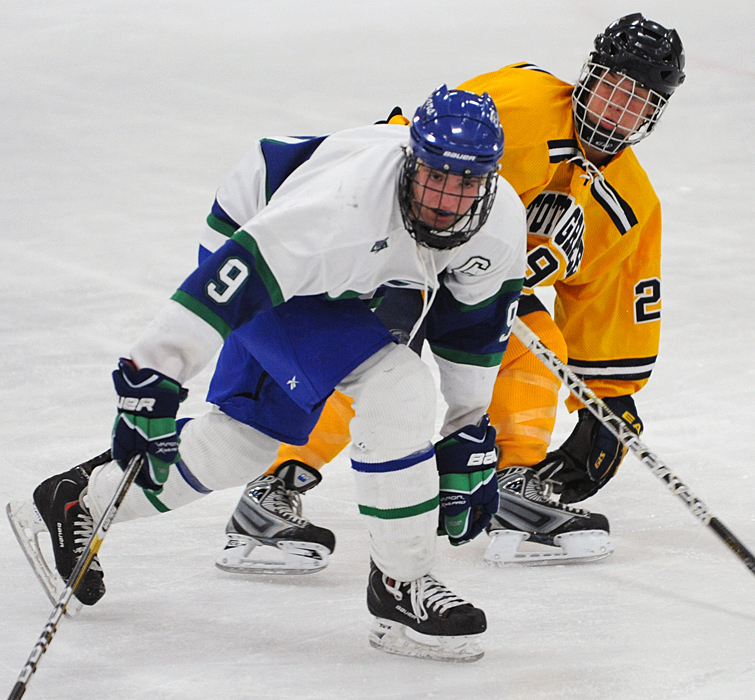 Freshman Spencer Naas and Donald Chute scored in the first period for Blake (8-1-2), and the Bears led 4-0 after the second after goals from Donald and Christopher Chute. Blake, ranked No. 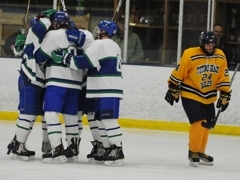 5 in Class 2A, went 3-for-3 on the power play while No. 8 Totino-Grace was 0-for-5. The Bears also scored a shorthanded goal. 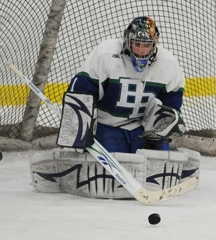 Ryan Hayes was a standout in goal for Blake, as he finished with 31 saves. 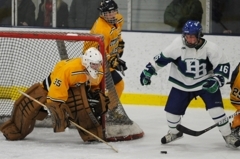 Totino-Grace goaltender Rory Davidowski made 25 saves. 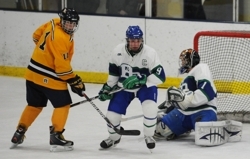 The senior forward and co-captain scored twice, added an assist and helped set the tempo for a Bears team that seemingly plays in high gear every shift. Chute was a key cog in a machine-like Blake power play that went 3-for-3. 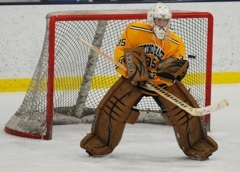 Hayes, a senior, made 31 saves and was tested repeatedly from the start. Rarely out of position, Hayes made save after save look routine because of his pinpoint positioning, and he had a shutout heading into the third period. The crafty senior forward is the definition of a playmaker. 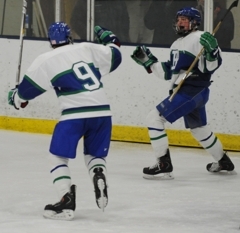 He helped set up three goals and assisted on another.